ACG Connect is an online, closed-network platform that brings ACG alumni together on a single network for easy searching and connecting/networking. It allows alums to post jobs, events and other opportunities, offer their support to the community if they are willing to help/mentor others as well as expand their alumni network. Directory: Find old friends and classmates, make new connections—professional or personal—and network with other ACG alumni in similar (or different) fields/industries. Your profile: Update your contact and employment information, and share updates with the rest of the ACG alumni network about projects you’re currently involved in. Knowledge sharing: Volunteer to be a mentor to other ACG alumni and current Deree students or search for alumni who can help you with career advice and information and/or career opportunities. Jobs and opportunities: Find and share job openings and other opportunities such as internships. Events: Find out about ACG alumni events! Messaging: Receive and send messages to other alumni through the platform or by email. Special interests: Follow or start a special interest page to bring together ACG alumni who have a common goal or interest. Social Media: The platform features latest ACG Alumni Facebook, YouTube and Flickr content. ACG Connect is a closed-network platform accessible only by ACG alumni and managed by the ACG Office of Development & Alumni Relations. Please be aware that the personal information you share will be viewable by everyone on the platform and ACG has no control over how members of the platform may use the information. 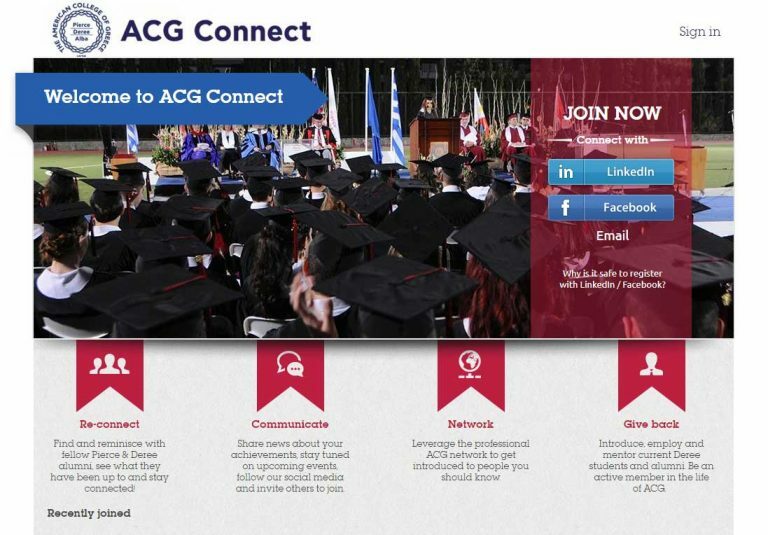 ACG alumni can access the platform online at acgconnect.org. To get started, alumni will need to register by creating a username and password (Recommended way is registering through LinkedIn, as it is the quickest and easiest and it includes professional information) and follow the step-by-step instructions to add the relevant information to their profile. Once registered they can post a message to say hello and introduce themselves, browse to find people they know, and invite other alumni by using the “invite alumni” arrow on the upper right hand side of their screen.